Variable stroke for use in tight places. 3-way loading: 14 oz. cartridge, bulk or suction. Includes air bleeder valve and bulk loader fitting. Develops up to 7,000 psi. Delivers 1 oz./40 strokes. 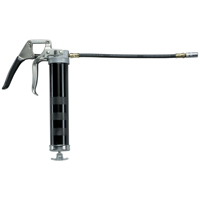 Includes 18" flex hose and vinyl handle grip.